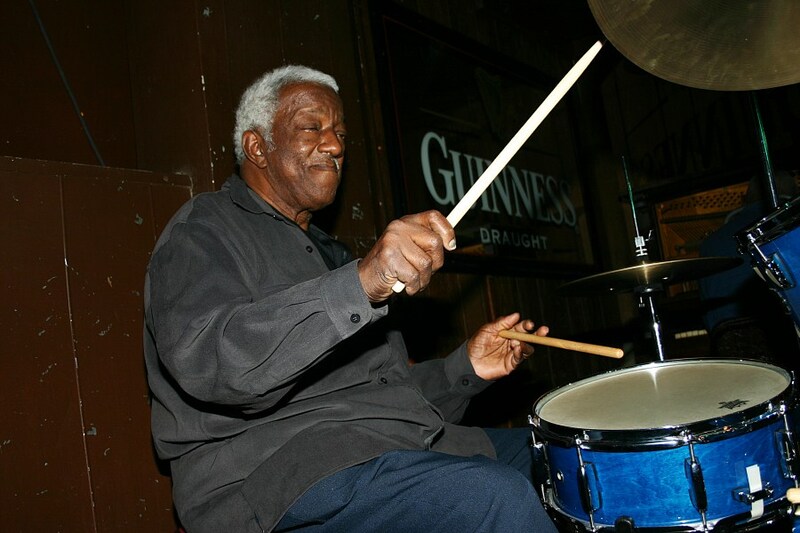 A benefit for the family of drummer Duke Dawson, who passed away recently at the age of 82, will be held from 4-8 p.m. Sunday, June 10 at the Hastings Street Ballroom, 15 E. Milwaukee, in Detroit (313-873-2955). Donations will be taken at the door for the show that will feature performances by The Alligators, The Flying Crowbars featuring Erich Goebel and James Cloyd, and many special guests. To see a previous post on Duke Dawson, click here. Fans of blues guitar will want to catch Saturday’s “McCarty’s Official Birthday Bash” at Callahan’s Music Hall in Auburn Hills. Joining Jim McCarty and his band Mystery Train will be his “Guitar Army,” including Johnnie Bassett, Bobby Murray, Big Al Grebovic and Jeff Grand. If you missed singer Janiva Magness at the Magic Bag in April, you’ll soon have another chance to hear her perform songs from her excellent new Alligator Records CD, “Stronger For It.” Magness and her band will perform at The Ark in Ann Arbor on Saturday, July 7. Tickets are $28 reserved, $21 general admission. For information, click www.theark.org. Also in Ann Arbor, Mike Brooks and Blueshouse/313 will perform at a CD release party for his new CD, “Mojo Hand,” on June 29 at Zal Gaz Grotto. Cover is $10 and CDs are only $10 at the show. When singer-guitarist Johnnie Bassett was getting ready to record the follow-up to his 2009 CD “The Gentleman Is Back,” he wasn’t sure how things would go. Bassett’s new Sly Dog Records release, ”I Can Make That Happen,” is one of the best of the 76-year-old’s lengthy career. The man known as the “Gentleman of the Blues” wondered what the band could do to top his last release. It only took a couple of rehearsals to answer that question. ”I Can Make That Happen” reunites Bassett with The Brothers Groove (keyboardist Chris Codish, bassist James Simonson and drummer Skeeto Valdez) and the Motor City Horns (saxophonist Keith Kaminski, trombonist John Rutherford, and trumpeters Bob Jensen and Mark Byerly), who played with him on his last recording and who regularly back him up at live shows. “One advantage is they know your style, they know practically every note you’re going to do before you do it,” Bassett said. “It just jells together when you have worked with the guys over the years. You feel each other’s moves and solos. You do whatever it takes to complement what they are doing, and they do the same for you. Special guests on the CD include trumpeter Dwight Adams, guitarists Brett Lucas and Jim “Moose” Brown, and singer Thornetta Davis, who performs a duet on the song “Teach Me To Love” that was written by Codish’s father, keyboardist Bob Codish. 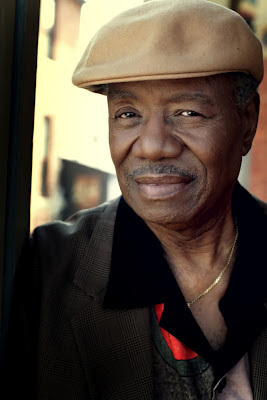 Davis first sang with Bassett during one of his gigs with his former band the Blues Insurgents at the east-side club Honest John’s. Bassett has a criteria for choosing his cover tunes. “It has to be somebody I like. I worked with Lowell Fulsom back in ’55 at a little honky tonk club in Richmond, Ind. 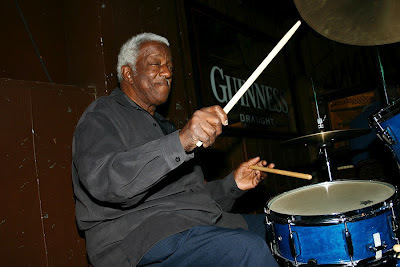 I backed him up when I was playing with Joe Weaver and the Blue Notes. I got to meet him and that was one of his signature songs. He was a great guy and a genuine bluesman. “Listening to him, I was in awe. I hadn’t really developed a style of my own then. I was just playing background as a side man. Bassett, who will turn 77 in October, still delivers the goods. The younger players who accompany him know he’s not a performer who is past his prime and relying only on his reputation. “He hasn’t lost anything,” said Chris Codish, who first started jamming with Bassett 20 years ago. “He’s gotten better and better and is still at the top of his game. It’s exciting to play music with him, even after all this time. He’s a master of the blues. Bassett impresses his fellow musicians with his unique style and open tunings. “Johnnie is great, he’s a living legend,” Simonson said. “Once you get past a certain level, you’re either playing with the real deal or you’re not. Johnnie is, absolutely, the real deal. Likes others his age, Bassett has his share of aches and pains, but he never doubts his decision to continue performing. “Especially when you walk in a club and everybody is glad to see you coming in. What can you say? You have to love it. “Unless you are writing your own stuff and everybody else is recording your stuff, you’re not going to get rich. It’s a labor of love. Bassett hoped to include a Jimi Hendrix tune on “I Can Make That Happen,” which would have been appropriate since a young Hendrix used to come to Bassett’s Sunday night open jams in Seattle in the ‘60s. “I was going to do a tribute thing called ‘The Wind Cries Mary,’ ‘cause I knew Jimmy James (Hendrix) when he was a kid,” Bassett said. “But, the estate wouldn’t let us do it. Sly Dog Records has an option for a third CD, which Bassett hopes they will pick up. He would like to record a CD of strictly instrumentals. “I’d like to do my favorite ballads and jazz tunes that I like to play,” Bassett said. He is also mulling the idea of recording a batch of instrumental Christmas tunes. A CD release party, featuring Bassett, The Brothers Groove and the Motor City Horns, will be held on Thursday, June 14 at Northern Lights Lounge, 660 W. Baltimore Ave, in Detroit. Call 313-873-1739 for information. To see a previous blog post on Johnnie Bassett, click here.